Retailers and consumer product manufacturers (CPG’s) are learning a great deal about how web page design and product positioning affect their e-commerce efforts. Measuring where the consumer’s eyes are trained and how long they dwell are key elements of insuring that shoppers click through on their products, place them into the on-line checkout basket. This learning has driven innovations in website structure, page layouts and enhancements in elevating the exposure of frequently purchased items for the convenience of the on-line shopper. Meanwhile, back in the bricks and mortar store, just the opposite dynamic remains firmly in place. That is, instead of conveniently accessible to the shopper, frequently purchased items are methodically buried among the tens of thousands of not-so-frequently purchased items and are inconveniently spread out through the physical store. Further, once the item is placed on the shelf of display there is little curiosity to understand how effectively its position provides the necessary ‘exposure’ to the in-store shopper to provide shopper-centric, convenient access to that item. As a result, it is not surprising that physical store retailers continue to struggle to maintain their market share and relevance. Store designs and merchandising methods have been slow to adapt to a shopper whose expectations and norms have radically changed by their on-line experiences. Bricks and mortar retailers can learn much from their on-line competitors relative to shopper engagement. It is also vitally important to remember that both physical and on-line retailers are indeed serving THE SAME SHOPPERS, just on different shopping occasions! Important research by colleague, Dr. Herb Sorensen and Peter Fader, Professor of Marketing at the Wharton School of Business established strong evidence that in-store shoppers interact with the products and fixtures just as they do with e-commerce sites.1 Given these similarities in the shopper-product engagement process in both venues, one could also conclude that both retailers and their brand suppliers would do well to transfer some of the learning done in the realm of e-commerce to the in-store environment. In fact, the only difference is the on-line environment is loaded with algorithms and rules that are designed to aide the shopper in making their purchases, while the in-store environment continues to burden the shopper with most of the purchase process. On-line retailers have learned that ‘exposure’ of relevant items to the shopper is key to driving clicks, purchases and return visits. Think of it as the shopper being ‘conditioned’ by these efficiencies that overtime, changes the shopper’s expectations across all channels. With each efficient on-line transaction, their comfort level of buying on-line and more importantly, their expectations for a satisfying retail experience are elevated. This increasing level of familiarity with the ease of e-commerce breeds repeat site visits and an ever-growing reliance on on-line retail sources for various items and occasions. More significantly, a new level of ‘ultra-convenience expectation’for the in-store shopping environments is a clear by-product of the changing shopper. Accordingly, it is not surprising that large store footprints in nearly every retail channel are under pressure. Shoppers, once enthralled with the impressive size and number of choices these behemoth stores offered are now finding them too time consuming and too tedious to shop given the shopper’s newly found familiarity with on-line and smaller format alternatives. Clearly, the status quo is not working as well as it once did, nor are the metrics that have served retailers so well over the past few decades. New in-store measurement techniques now enable retailers and their supplier partners an accurate means of gauging the varying degrees of exposure that each department, category and even specific items have to the shoppers. 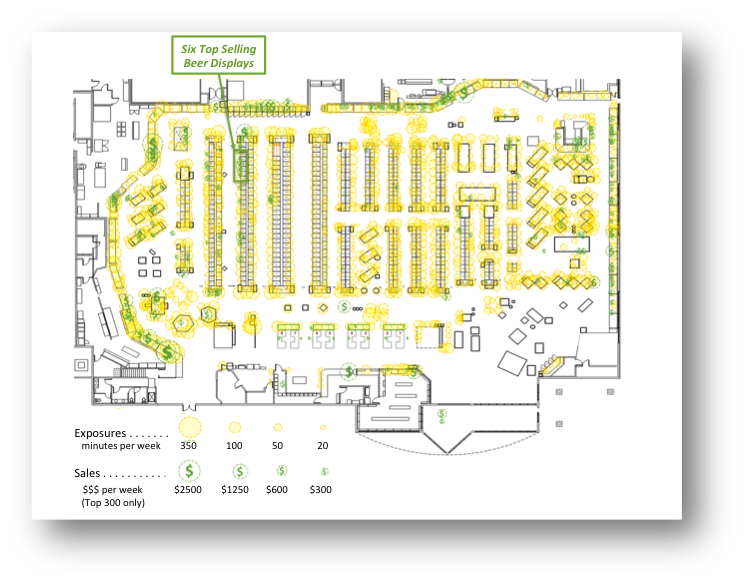 The adjacent store map provides a visual guide as to where shopper exposure occurs within the store (with the larger the yellow circles indicating the more exposure). Likewise the larger green circles with “$” symbols indicate where the more dollar sales are being generated. 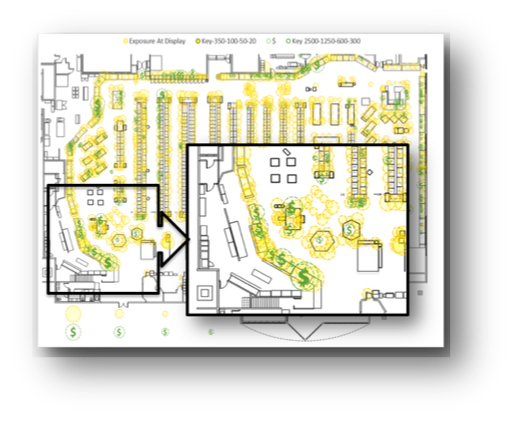 The map also represents the first step in understanding in-store performance. The same level of specificity as current ‘on-line shopping’ metrics, this map provides empirical feedback as to how well exposed departments, categories and items are within the store and how ‘exposure’ actually effects sales. Intuitively we know that the more exposure each item and category has to shoppers, the higher the likelihood for being purchased. However, it is the sensitivity to that exposure that can vary depending upon whether the item or category is one of the Top Sellers or, conversely, less frequently purchased. E-retailers are fanatical about knowing what their customers have bought in the past and rightfully so. They know that if shoppers see what they want quickly, they are more likely to buy. To hasten the purchase e-retailers provide numerous reminders to their shoppers as to what they have bought and what other folks typically buy who also buy similar items. They encourage shoppers to build a list and use it as a means to accelerate the purchasing process. While physical store retailers cannot practically place each individual shopper’s items in a more convenient location in the store, traditional retailers ARE capable of strategically placing the items that sell the most in areas of the store where the shopper habitually travels, trip after trip. First, let’s establish the importance of the top selling items to the retailer and their shoppers. For most retailers, just a few hundred items out of the tens of thousands they offer drive as much as forty to fifty percent of their sales. 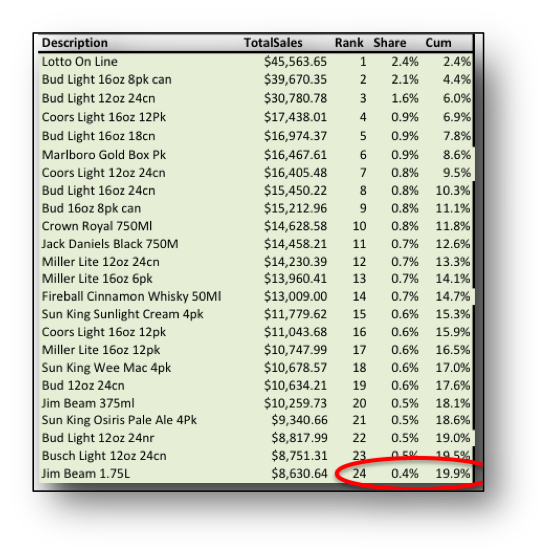 The adjacent table illustrates the importance of a mere 24 items among a total offering of over 5,000 sku’s in a very successful package liquor chain. The numbers reveal that nearly 20%of the store’s entire sales are derived from these few top-selling items. Placing these items in the context of on-line retailing, the e-retailer would be shouting about these top sellers on the home page of their site, given the relevance and the share of volume these items represent. Bricks and mortar retailers conversely, often use these items as ‘customer draw’ points in the store, thinking that if the shopper has to go to the far reaches of the store to find these items they will also pass by other items they did not intend to buy and impulse buy some incremental items on their extended journey. On-line retailers could do the same by designing their websites so that shoppers must visit multiple pages en route to make their purchases, but they choose not to. They have learned that making the purchase connection quicklyis more likely to increase the chances of a sale. As a bonus, speeding up the buying process provides the shopper more ‘time’ to make additional purchases, once they accomplish their original shopping objectives. While various channels of retailing will produce a different ratio then package liquor stores, the general trend is remarkably the same. That is, a very few items, often referred to as the ‘Big Head’, command a disproportionate amount of sales and profits for the retailer. In most traditional supermarkets most of the top selling items/most relevant items are located anywhere between 30 seconds to 110 seconds (at a normal walking pace) from the store’s entry. While the locations of the perishable items are understandably placed on the perimeter of the store, where the majority of refrigerated cases are located for logistical purposes such as access to Freon lines and storage coolers, other top selling items are placed near the back of the store. Retailers hold on to the belief that placing best sellers in the far reaches of their stores induces the shopper to ‘shop more of the store’ and consequently be exposed to more items they may impulse buy. Declining sales per square foot performance among many of the big box retailers would suggest this formula is no longer working for the convenience-driven consumer. As we learn where categories and items are placed in the physical store, we can begin to think about improving their sales on the basis of their exposure and convenience to the in-store shopper. Clearly items will exist that sell well without requiring high levels of shopper exposure. However, other categories and items may be underperforming in terms of sales due to their placement in the store that does not afford them adequate exposure. Certainly not every category can occupy the positions in the store where shoppers migrate, shop and purchase, so prioritizing the placement of categories and items on the basis of the potential upside now possible. Armed with detailed ‘exposure’ metrics, a performance ratio the measures the relationship between exposure and the sales associated with that item placement can be formulated. The importance of this new metric is its intrinsic linking exposure, time, and sales. If we know the relationship between the three…… merchandisers can then start to plan their weekly programs wit the goal of optimizing sales through providing adequate exposure to those items to require it for robust sales. Others, may do fine without being placed in peak exposure areas, but new decisions can be made to use the store’s geography and its shoppers behavior as new tools for both weekly merchandising and long-term store design. Practical application of Sales per Exposure Time (SET) can be very revealing particularly when evaluating the performance of individual category sets. Specifically, referring to the neighboring store map, exposure metrics reveal the level of exposure each key area of the store receives from shoppers in terms of minutes per week. Larger yellow circles denote higher levels of exposure and smaller circles, conversely less. By overlaying the dollars produced from each of these areas retailers can begin to visually understand where sales are coming from within the store, Additionally this approach also reveals the effect of shopper exposure on those sales. In the particular store illustrated above, a category such as refrigerated beer can be evaluated not just in the broader context of the shopper exposure and sales throughout the store, but also within the category itself. …. under-achieving at only $9/hr. 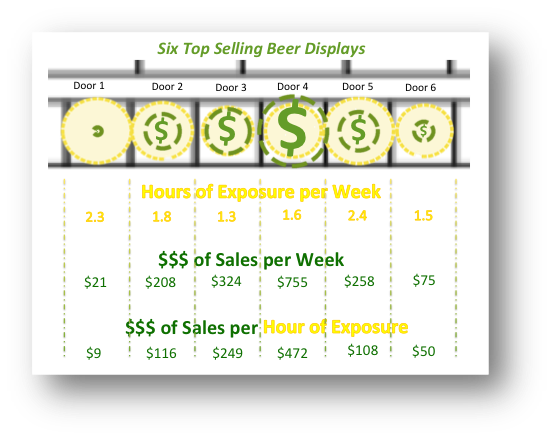 Door six produces very little sales from the lowest level of shopper exposure (1.5hrs/wk). 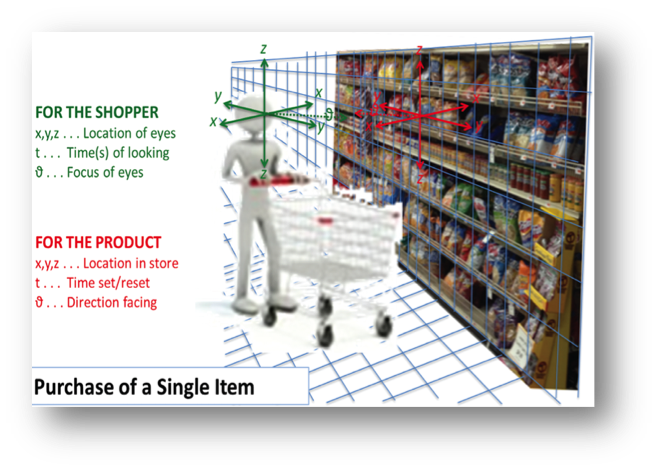 With the goal of attracting ‘eyeballs’ to each door within the refrigerated beer set and then to produce incremental sales from the shopper traffic that already exists in this particular store, cogent recommendations can then be made to improve sales on the basis of this new set of information. One such example, is given as follows. As this illustration demonstrates, using a combination of intuitive merchandising practices, the balancing of higher sales and exposure items with those that underperform, a new, more shopper-centric set is possible to offer. As this paper has demonstrated, the essence of a category/item placement strategy is to first understand the relationship between sales and exposure. To provide a strategic tool to better use these new data points, the neighboring matrix depicts a fundamental method of segmenting categories and items into manageable groups that lend themselves to common strategies. Many of the categories and items will fall into the ‘average group’ which simple means there is no significant deviation (R2 ) from the relationship between sales and exposure, but the four outlier groups can provide a logical starting point in terms of making placement changes to drive incremental sales and transaction size. High Exposure/High Sales: With these categories and items, their placement appears to be paying off. Shoppers are exposed to the items and are responding with purchases. The placement, item, and price of these items are working. Smart cross merchandising of these areas is one viable strategy to leverage these areas. High Exposure/Low Sales: This is perhaps the worse case scenario. These items and categories are not converting the exposure they are receiving, in other words not taking advantage of their placement in the store. With this in mind the retailer and brand supplier should look first at pricing, promotional support, and overall share of requirements these items represent. Ultimately if adjustments cannot improve their performance, a review of these items in terms of (sku) reduction and other remedial initiatives is in order. 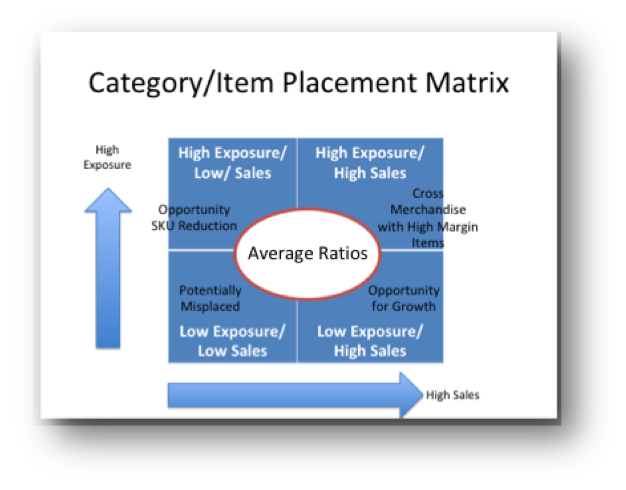 Low Exposure/High Sales: While this category represents a very small percentage of items and categories but for those that qualify, these items become top candidates for either moving to higher exposure areas, or at least secondary placements in those areas with higher shopper exposure. Low Exposure/Low Sales: Unfortunately for bricks and mortar retailers, this group represents the largest number of items and is often referred to as the “Long Tail”. The challenge for this group is to determine which items are necessary to maintain a solid ‘variety’ that in part attracts shoppers to the store, which items have an opportunity to increase sales with added exposure to shoppers, and which items are susceptible to being de-listed or moved to ‘on-line only’ status. These items are also good candidates to be accessed through in-store kiosk for home delivery or in-store pick up. Bricks and mortar stores are far from becoming obsolete, but will continue to experience erosion of the share of shoppers and their share of requirements, as on-line retailing continues to expand its shopper base and market share. Physical stores that do not recognize that the changing shopper norms and expectations are affecting their business will continue to decline. On-line retailers have quickly learned that guiding shoppers to relevant items and categories is key to driving sales and repeat visits. Bricks and mortar retailers can begin to create much the same type of shopping environment as their on-line counterparts by employing new tools and metrics that measure the shopper’s time in store and their exposure to categories and items. Vital to more quickly engaging shoppers in-store is identifying the “Top Selling” items, the minority of items that the majority of shoppers buy and to ensure that these categories and items are positioned to hasten the shopper’s purchase. Retailers can no longer assume that shoppers will ‘do the work’ to find these items in the far reaches of large stores. Overall, categories and items can be measured by how effectively they are leveraging its existing exposure to shoppers.Using a segmentation system that groups items and categories relative to their placement in the store and the resulting exposure and sales they garner from that positioning is a key first step in developing a coherent ‘placement strategy’. Specific changes to individual category sets using the new metric of Sales/Time of Exposure, (SET) represents a breakthrough method of optimizing existing customer traffic within the physical store. Using these new metrics does not necessitate ‘radical’ layout changes, or store resets, but rather subtle merchandising tweaks that do not disrupt the shopper or the operations of the store. Solid, traditional merchandising practices in tandem with (SET) remain an important part of increasing in-store shopper engagement.